This week Nokia released their results for Q4, 2013 and the number of sold Lumias was missing from the report. Later on it was disclosed and it was lower than for Q3. Considering that Q4 is a “Holiday season” this was obviously met with a bunch of negative press, even though year-on-year results demonstrated substantial growth. Folks who think holiday sales of WP declined are incorrect. 🙂 Activations more than doubled last holidays and increased each holiday month. While the message is a little cryptic, it obviously claims that Windows Phone sales didn’t decline during the holidays and, since Nokia is by far the biggest maker of Windows Phones, it only added more to the confusion. So I was curious to use our own data (all publicly available) to try to figure out what is going on. I’m not a statistician by any means and there’s a reason why, while I was studying at the faculty of mathematics, I ended up graduating with a degree in computer science 🙂 So, if I made some terrible mistake in my calculations, please, correct me in the comments below and I’ll be happy to correct them (if possible) or just declare this whole post a big mistake (if it’s totally off). 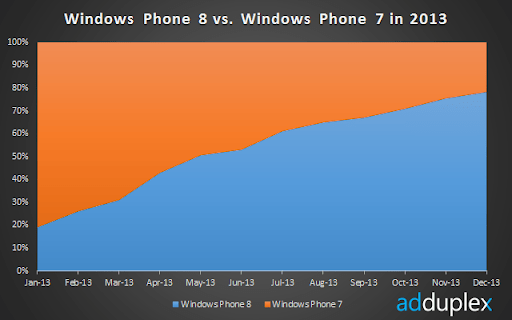 Here you can see how over the course of 2013 Windows Phone 8 has moved from 19% of all Windows Phones to more than 78%. We will use this to try and calculate something that I always refrained from doing – Windows Phone sales numbers. Now this is where I’ll make some relatively baseless assumptions. 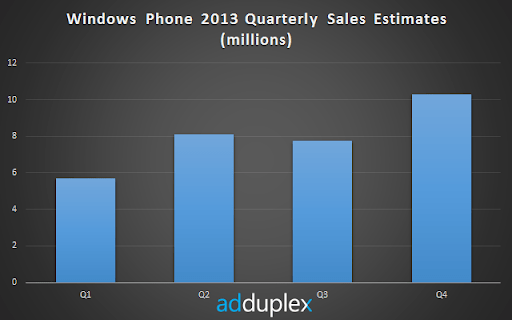 First I’ll assume that sales of Windows Phone 7 devices were not substantial during 2013. This obviously not true, but my guess is that as many Windows Phone 7 devices were “discarded” in 2013 as were sold. I’d even say that more were discarded. So I’ll assume that the number of WP7 devices in use was decreasing by 2% every month of 2013. Why 2%? No reason. But as I mentioned before the actual number doesn’t really matter when comparing Q4 and Q3 of 2013. 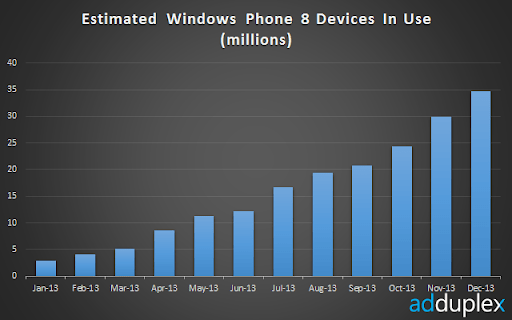 So now we need to figure out how many Windows Phone 7 devices were in use by January 2013. This post on The Verge suggests that Nokia sold 13.3 million Lumias in 2012 and another million in 2011. By the end of 2012 Nokia had ~75% share of the Windows Phones in use. So that makes around 19 million WPs in total. A few of the phones sold were already WP8 and some were already out of use (broken/returned/etc.). So let’s say 12 million WP7 were in use by the end of 2013. Another pretty baseless assumption, but again, not essential for the issue in question. As you can see, based on my calculations Q4 was actually better than Q3 which was worse than Q2. Either my calculations contain some major logical or arithmetic mistake or the record number of Lumia phones Nokia shipped in Q3 was actually sold to consumers in during the holidays (aka Q4) and both “official” statements (from Nokia and Joe Belfiore) could be correct. P.S. : we actually see some data that probably reaffirms lower Q4 channel shipments from Nokia, but more on that in our monthly Windows Phone stats report next week. Subscribe so you don’t miss it. I guess they were expecting growth in q3 and q4 that didn’t happen .